monkey-toes: oo, oo, pick me, pick me! oo, oo, pick me, pick me! Oh my, poor, poor Lauri Harrison of Mom To Be Depot She had the crazy hard task of choosing from a TON of adorable kiddos all dressed in their Halloween costumes and Monkey-Toes. First, of course, any toddler sporting Monkey-Toes is going to be cute (I'm not partial or anything), but second, having them in their costumes - seriously, it doesn't get any more visually delightful than that! Little Buzzy Bee Nikki (21 months), is bringin' sassy back! Darling little Nikki, will be sporting $25 worth of new Monkey-Toes products with her prize for 3rd place Congrats Nikki! You're BOO-tiful! 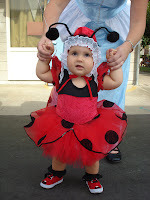 Our 2nd place prize goes to Kayla (11 1/2 months) the teeny-tiny Little Ladybug. Isn't she precious? This petite princess will be donning $50 worth of new Monkey-Toes products. Congrats little lady! 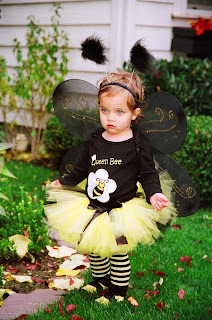 The Queen Bee, Addison (18 months), had the whole Bee sha-bang with the wings and antenna too! I'm guessing this little Bee rules the hive at home. Congratulations Addison - you're going to sport the grand prize, the ultimate - $100 worth of Monkey-Toes products!!! If you're little one was one of these three prize winners - please email us right away to claim your prize code (you can claim your prize and shop from the comfort of your home, and in your skivvies if you'd like - but that info is TMI). Thank you so much to EVERYONE who participated. It truly was difficult to turn any little pumpkin away. So, we're feeling generous and are offering EVERYONE 25% off over the weekend. Get your holiday shopping for the little one's done now - it's only valid through Monday. Enter "flngenrus08" at checkout and receive your discount. Also, stay tuned, we will be posting some of the other great entries too.